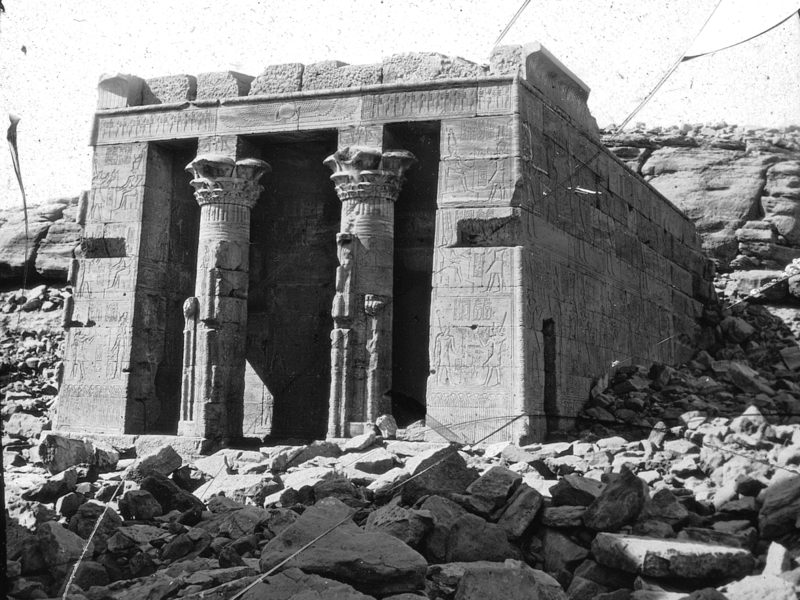 The Brooklyn Museum has a lantern slide showing this temple in situ. 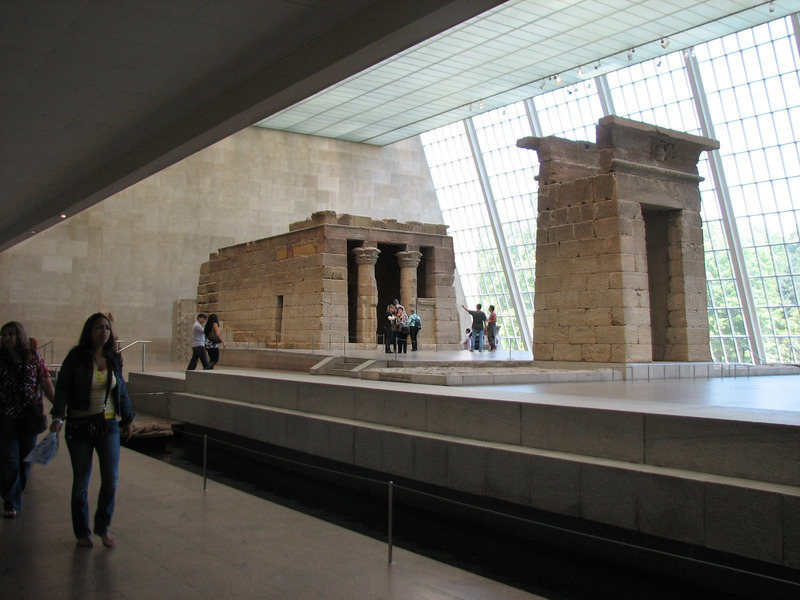 "Egyptian temples were not simply houses for a cult image but also represented, in their design and decoration, a variety of religious and mythological concepts. One important symbolic aspect was based on the understanding of the temple as an image of the natural world as the Egyptians knew it. 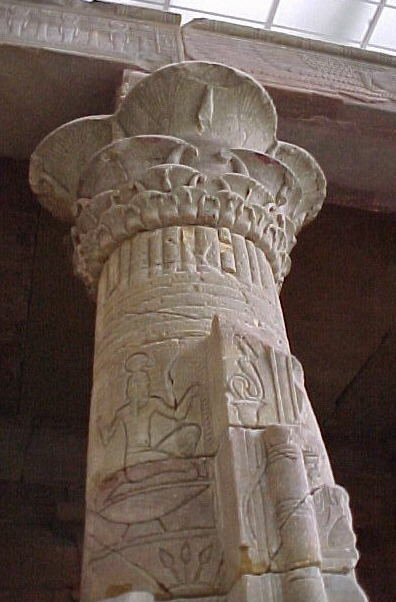 Lining the temple base are carvings of papyrus and lotus plants that seem to grow from water, symbolized by figures of the Nile god Hapy. 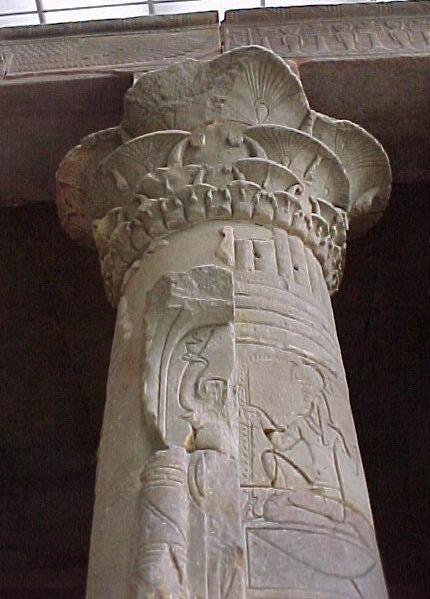 The two columns on the porch rise toward the sky like tall bundles of papyrus stalks with lotus blossoms bound with them." "Above the gate and temple entrance are images of the sun disk flanked by the outspread wings of Horus, the sky god. The sky is also represented by the vultures, wings outspread, that appear on the ceiling of the entrance porch. "On the outer walls between earth and sky are carved scenes of the king making offerings to deities, who hold scepters and the symbol of life." "The figures are carved in sunk relief. In the brilliant Egyptian sunlight, shadows cast along the figures' edges would have emphasized their outlines. Isis, Osiris, their son Horus, and the other deities are identified by their crowns and the inscriptions beside their figures. These scenes are repeated in two horizontal registers. The king is identified by his regalia and by his names, which appear close to his head in elongated oval shapes called cartouches; many of the cartouches simply read "pharaoh." This king was actually Caesar Augustus of Rome, who, as ruler of Egypt, had himself depicted in the traditional regalia of the pharaoh. 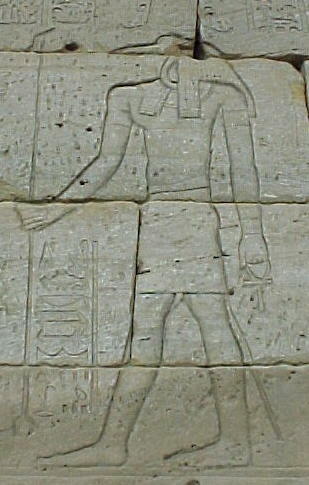 Augustus had many temples erected in Egyptian style, honoring Egyptian deities. 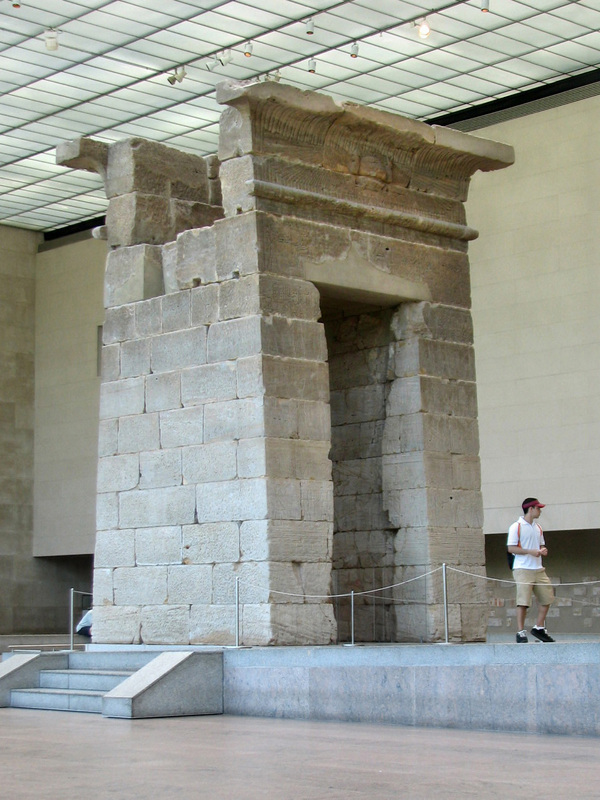 This small temple, built about 15 B.C.E., honored the goddess Isis and, beside her, Pedesi and Pihor, deified sons of a local Nubian chieftain. 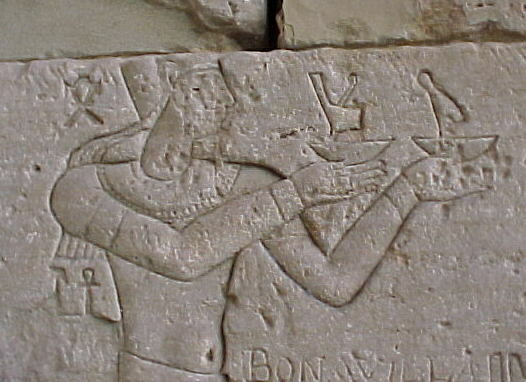 "In the first room of the temple, reliefs again show the "pharaoh" praying and offering to the gods, but the relief here is raised from the background so that the figures can be seen easily in the more indirect light. 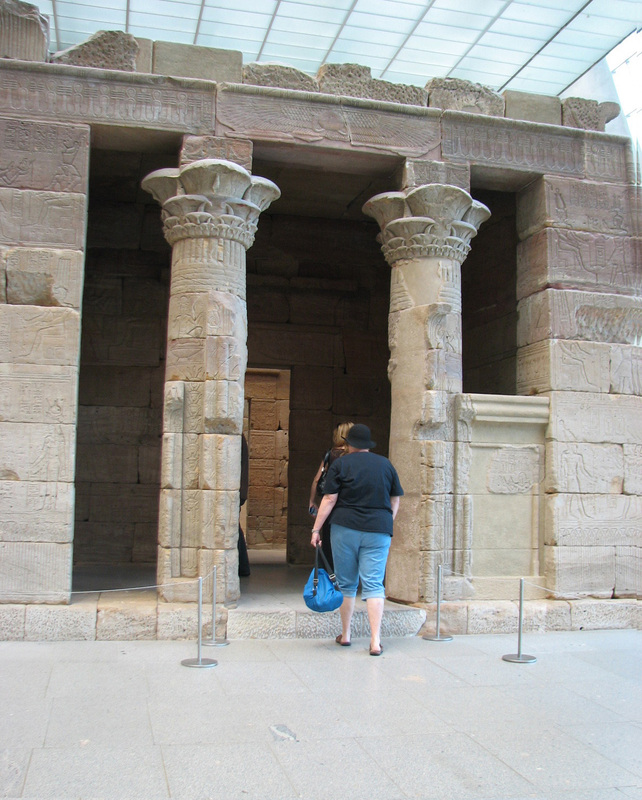 From this room one can look into the temple past the middle room used for offering ceremonies and into the sanctuary of the goddess Isis. 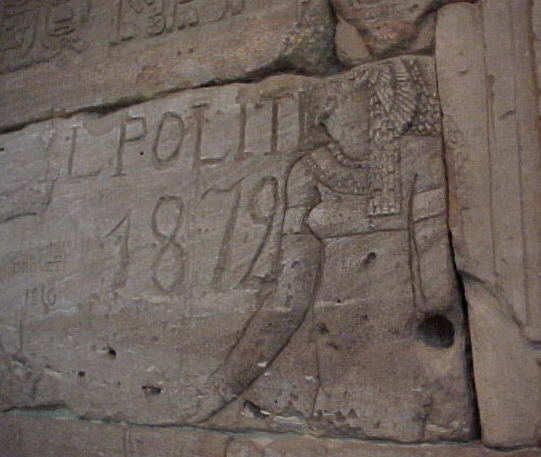 The only carvings in these two rooms are around the door frame leading into the sanctuary and on the back wall of the sanctuary, where a relief depicts Pihor worshiping Isis, and below – partly destroyed – Pedesi worshiping Osiris."